Last night Monica and I curled up on the couch to watch one of my favorite movies The Thomas Crown Affair (the 1999 remake). It’s cinema candy which I can’t help but stuff my face with now and again. Also, Monica hadn’t ever seen the film! That injustice had to be rectified. (And she still hasn’t seen Sneakers , the horror!) So, getting back to the meet of this message, I was walking across the Diag today on my way to class when I notice a girl walking toward me carrying a frame. At first I only see the back side of it and assume it’s empty, but as she gets nearer she happened to turn it over. Consider that it really isn’t often that I see people walking around town with framed prints. I can’t specifically recall any instances in fact, but I’m sure it happens and it is hard to imagine I haven’t seen it before. 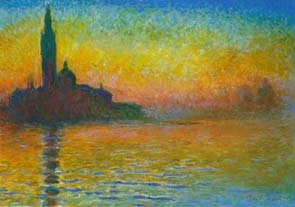 But, it is a rare occurance and even considering the popularity of Monet in the college-dorm setting I still think it is very freaky that she was carrying the very same painting that plays the featured role in The Thomas Crown Affair , Claude Monet’s San Giorgio Maggiore by Twilight . ‘Sup with that?